TOPS CMS-1500 Health Insurance Claim Forms are approved by the National Uniform Claim Committee (NUCC) and the OMB. 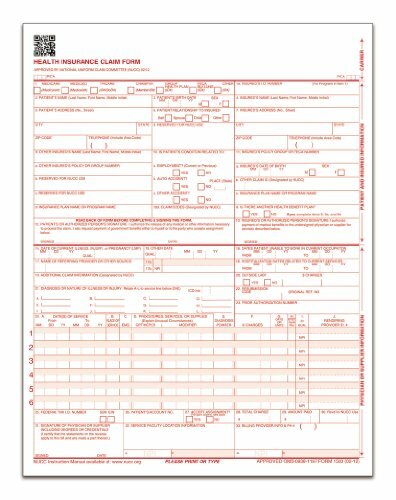 For use with laser printers, these forms are printed in red OCR ink on white 20# bond paper. They measure 8.5 x 11 inches and come 500 per pack. This version (02/12) is for use beginning January 6, 2014. Since 1952, TOPS has provided quality products and services to businesses throughout the world. TOPS continues that commitment providing innovative, high quality value-added products for the office, school and home. Whether it's notebooks, writing pads, record books, time cards, business forms, or any of the hundreds of items we offer, you can count on TOPS products to help.